From our neighbors to the north, comes an exciting new band that thrives on technology. This unique group certainly knows how to party, and dresses the part. 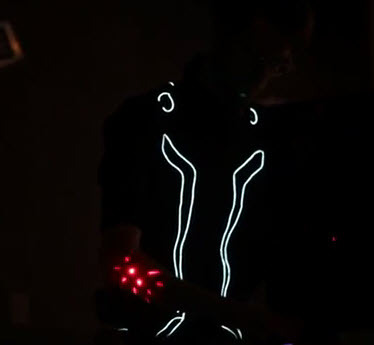 As each band member comes on stage with a different Tron-inspired persona, the crowd lights up with excitement. Not to be thought of a just a band, or just a bar, Top Men want to you to simply, experience. Next time you are up in Canada, look up Top Men for an experience you will never forget. Costumes were made by the band, and purchased Ready Made EL Wire Kits from Ellumiglow.com. Click on the video below to check them out in action.